Just Another Day in Japan: Odori time! This is an entry written for the February 2011 Blog Matsuri, which can be found this month at Lonelee Planet. So first a shout-out and thanks to our gracious host, Reesan! Actually, until I did a little research five minutes ago, I had little idea, either. Although normally 踊り （おどり）means "dance," 都をどり has a special way of being written. You'll recognize 「都」as the "to" part of 京都 (Kyoto). 「都」indicates "city" or in this case "capital." 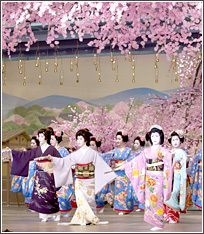 So Miyako Odori is sometimes translated as "Dance of the Old Capital." It's also sometimes called the "Cherry Dance," as it seems to be associated with sakura blossoms and is performed in April, around the time when the flowers are in bloom. Why do I bring this up? Well, I have to give the Japanese people credit for their enthusiasm in sharing their culture. I must have asked one of the English teachers I work with some time ago about it (or maybe he asked me if I knew it), because the other day he came up to me and asked if I was still interested in it. Instead of telling him I had no recollection of our conversation about Miyako Odori, I told him sure. Well, fast forward a couple days and he's reserved tickets for me to go see the dance in April with him and his wife. He's even paying for half of my ticket as a gift. Apparently this is a yearly event, and tickets sell out fairly quick. A bit expensive, too - about 4000 yen ($40+) per person. Honestly I usually find these kind of performances interesting for a few minutes tops, but it's just this once and he's a nice guy, so I'll give it a shot. It was generous of him to think of me and pay for half my ticket, so what the hey. Anyhow, here's what the dance looks like. Sheesh, now I don't even have the surprise factor to look forward to! To check out the other entries in this month's blog matsuri, go here. That looks... just as interesting as Riverdance. Heh heh...never seen Riverdance so I won't be able to compare, but something tells me you're right.